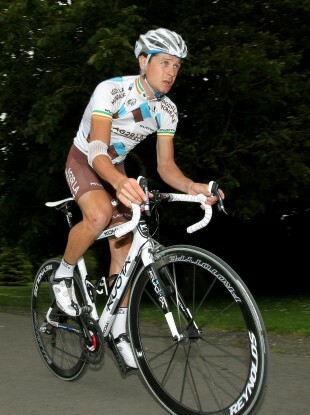 Nicolas Roche believes the chapter on widespread doping in cycling is now closed. NICOLAS ROCHE HAS admitted the sport of cycling is not yet clean from the scourge of doping but feels it is ‘a much cleaner one’ than it was a decade ago. The Saxo Bank rider, son of 1987 Tour de France winner Stephen Roche, was on RTÉ’s Prime Time show on Thursday to discuss the fall-out from the United States Anti-Doping Agency’s claims that Lance Armstrong and his US Postal Service team had been involved in systematic, performance-enhancing doping for eight years. Roche admitted the revelations that may yet cost Armstrong his seven Tour de France titles came as ‘a blast’ to the cycling world. However, he added that professional cyclists today are ’paying for something that happened seven or eight years ago’. When pressed on whether the sport is not drugs free, Roche responded, “I’m not saying it’s a clean one, I’m saying it’s a much cleaner one, which is a big difference. Everybody cheats at some stage, in every other aspect of life. Fake I.Ds, they cheat in their Leaving Certificate exams, soccer pitches. Roche defended his father from any suggestions that his reputation may be tarnished due to the drug revelations that are taking down some of the sport’s biggest names. “I don’t think my Dad has been caught or (tested) positive at any stage,” he said. “It was only that some put had put a doubt on him. There was no proof on it. “It was only said and written that maybe there is but today there is nothing on Dad. I don’t want to implicate him in any way. Contador had his troubles and he paid a price for what he did over the past two years. “There is obviously going to be more stories to come in the future but this chapter, this huge one, is now closed. You can see the full interview by clicking here. Email “Nicolas Roche: Everybody cheats at some stage in some aspect of life”. Feedback on “Nicolas Roche: Everybody cheats at some stage in some aspect of life”.